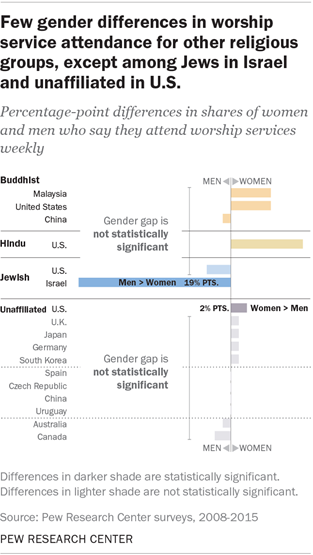 In 23 of the 81 nations, men and women are about equally likely to attend services weekly. In 30 countries, women are more likely than men to report attending services weekly. Most of these countries have Christian majorities or large Christian populations. In 28 other countries, men are more likely than women to report attending services weekly, often by large margins. In Afghanistan, for example, the share of men attending services at least once a week exceeds the share of women by 84 percentage points; in Pakistan the margin is 72 points and in Bangladesh it is 66 points. Muslims make up a large share of the population in all of these countries except for Israel, the only country in the world with a majority Jewish population. This distinctive pattern at the country level is largely explained by religious norms that prioritize male participation in Muslim and Jewish worship services. In most Islamic societies, Muslim men are expected to attend communal Friday midday prayers in the mosque. Women, however, can fulfill the Friday prayers obligation individually, either inside or outside the mosque. Likewise, the Orthodox Jewish tradition does not count women as part of a minyan (at least 10 men needed to hold a service). When Muslim and Orthodox Jewish women do attend communal worship services, they often pray separately from men. Although Muslim and Orthodox Jewish men are expected to attend worship services, attendance may still be a valid indicator of men’s religiousness. On the other hand, the fact that women do not attend as frequently or participate as fully as men in some countries does not necessarily mean they are less pious. Indeed, as discussed in the next chapter, Muslim women and men are about equally likely to report that they pray at least once a day. Pew Research Center has data specifically on Muslim attendance patterns in 39 countries. In most of them, Muslims are the largest religious group in the population. Across these 39 countries, a much larger share of Muslim men (70%) than women (42%) report attending services weekly, an average gender gap of 28 points. Among Muslims in the United States, the gender gap in attendance is smaller than the average gap across all 39 countries: 57% of U.S. Muslim men attend weekly compared with 37% of U.S. Muslim women, a 20-point gap. Among Christians, a different pattern emerges. Across the 53 countries with enough Christian respondents to analyze data on attendance, 53% of Christian women and 46% of Christian men say they attend services at least once a week, an average difference of 7 percentage points. In 28 of these 53 countries, notably larger shares of Christian women than men attend worship services weekly. 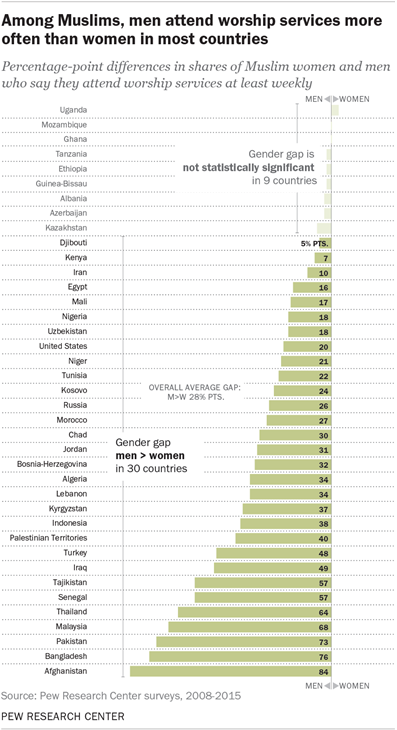 The largest differences are in Colombia and Italy (which have 20- and 19-point gender gaps, respectively). In 25 of the 53 countries, Christians of both genders are equally likely to regularly attend services. There are no countries where Christian men are significantly more likely than Christian women to attend services weekly. Israel and the United States together hold about 80% of the world’s Jewish population and they are the two countries with sufficient numbers of Jews to analyze differences in men’s and women’s attendance at worship services. There are only a small number of countries for which Pew Research Center has data on a large enough number of Hindus and Buddhists to permit analysis of the gender gap in attendance.20 This study finds no significant gender differences among Hindus in the United States. Similarly, differences are not significant among Buddhist men and women in the three countries for which the Center has data: Malaysia, China and the United States. 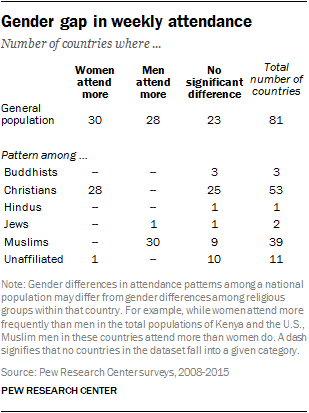 Pew Research Center has collected data in 11 countries on worship attendance rates among the religiously unaffiliated, who identify as atheist, agnostic or “nothing in particular.” In the United States, there is a small gender difference of 2 percentage points between unaffiliated women (5%) and men (3%) who report attending worship services weekly.[21. Pew Research Center’s 2014 U.S. Religious Landscape Study included a very large sample of unaffiliated respondents, providing the statistical power to ensure that this 2-point difference is statistically significant. Q&A: Why are women generally more religious than men?